This is a guest post from Matthew Ho of Native Tongue, creator of language learning games, including Mandarin Madness app. Chinese New Year is always a fun and special time for me. My family celebrates it every year. Our local Chinatown in Sydney, Australia has a lot of events on including dragon dances, street festivals, night markets and the Chinese restaurants are usually full. There are also displays of Chinese lanterns, firecrackers and occasionally fireworks. Red packets of money are handed out and there are special foods that we eat at this time of the year as well. This year is the Year of the Snake and it falls on Sunday, February 10. The date is based on the lunisolar calendar and festivities can happen over a two week period. It is a public holiday in some Asian countries. Chinese New Year is celebrated in Hong Kong, China, Taiwan, Malaysia, Singapore, Korean, Vietnam, Japan and many countries with significant Chinese populations. 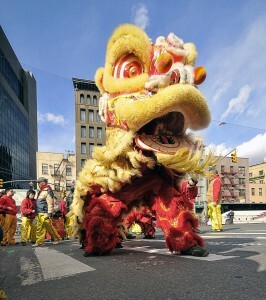 If you live near a Chinatown, there will be a celebration there too! According to legend, the beginning of Chinese New Year started off with a fight against a mythical beast called Nian (年), which is also the word for “year”. This beast would eat the villager’s crops, livestock and children. To ward off this beast, the villagers would put food in front of their doors. They would also wear red clothing, hang red signs, and set off firecrackers to frighten off the beast. Far less interesting is that it is a celebration of the end of winter and the welcoming of the spring season. There are special foods that are eaten during Chinese New year. Some of these include nián gāo (年糕) which is a glutinous rice cake. 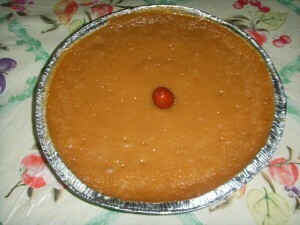 It means New Year Cake and is a sticky cake with red Chinese dates on top. Personally, I’m not a huge fan of the taste of this cake. Noodles that are long and uncut are also eaten. The noodles symbolise a long life. The Chinese call it 长寿面 (cháng shòu miàn). Other foods that I eat during Chinese New Year include fish, prawns, oysters and Chinese sweets. Interestingly, the character for lettuce ‘cái’(菜) sounds like fortune ‘cái’(财). So there are foods that are eaten with lettuce wrapped around them. If you go to some Chinese restaurants, they may also have a special menu for Chinese New year foods. Try out the Waygo app on the menu and find out what they are! You need to be mindful if you are travelling around Chinese New Year. Local people will travel to their home cities to visit their families, and there will be people coming from overseas. Hence transport options such as flights, trains and buses can be quite busy and booked out months in advance. A few years ago I travelled to Vietnam and did not take into account Tết celebrations, which is the Vietnamese celebration of New Year. We had only booked our accommodation for a few days. Our hostel was booked out, and many accommodation options were not available. So we booked a tour to Halong Bay and spent a few days there. Planning around Chinese New Year is something you should consider if travelling around this time. Finally, I want to leave you with a few phrases in Mandarin to try out during Chinese New Year. The last phrase is said by kids to an older relative who is married and will give them a red envelope with money. Its worth a try to a close friend or colleague! If you are looking to learn Mandarin, check out our app “Mandarin Madness” which also includes a New Year language pack in our iphone app. I hope you and your families enjoy Chinese New Year and may it bring you prosperity! ← Thank You for Being a Part of the Waygo Journey!